Superior labral (labrum) lesions can cause painful mechanical symptoms and difficulty with overhead activities whether they be athletic or those of daily living. Superior labrum tears were first described by Andrews et al. In a study that reviewed their experience in 73 throwing athletes, the authors identified tears of the labrum involving the anterosuperior aspect near the origin of the biceps tendon. They attributed this lesion to the biceps tendon being pulled off the labrum as a result of force generated during the throwing motion. Snyder et al coined the term SLAP (superior labrum, anterior and posterior) lesion to describe a more extensive injury. A SLAP lesion, as described by Snyder, involves a tear of the superior labrum, which starts posteriorly and extends anteriorly to include the anchor of the biceps tendon to the superior labrum. The injuries were subdivided into four types (I-IV). Much as in Andrews' findings, a subset of patients who reported a traction injury were identified. However, the majority of patients related a history of a compressive injury to the shoulder secondary to a fall on an outstretched arm in a flexed and abducted position. SLAP lesions, as opposed to occult anterior instability, are likely the underlying cause of the so-called dead arm syndrome in throwing athletes. Regardless of whether injuries to the superior labrum–biceps complex are secondary to a throwing or nonthrowing etiology, they can be a source of considerable disability for the patient. Initial operative treatment of superior labral lesions consisted of debridement only. This therapy is appropriate for type I and type III lesions, as well as for some type IV lesions, in which the biceps anchor is intact. However, in type II and in type IV lesions in which the biceps anchor is unstable, debridement alone yields poor results. Early attempts at arthroscopic fixation used a metal staple. This technique was discontinued because of concerns for chondral injury as well as the need for a second surgery for staple removal. For similar reasons, techniques involving a metal screw are no longer used. A transglenoid technique similar in concept to a transglenoid technique for a Bankart repair has been described; however, this is technically difficult and has fallen out of favor. Good results were initially reported with use of a bioabsorbable tack. However, complications, including implant breakage with resultant particulate debris and a foreign body reaction, have been reported. The glenoid labrum is a triangular fibrocartilaginous structure that serves to deepen the glenoid. Whereas tears of the anteroinferior labrum have long been known to be associated with significant shoulder pathology, it is really only since the advent of shoulder arthroscopy that injuries of the superior labrum have been appreciated as a potential pathologic lesion. Superior labrum anterior and posterior (SLAP) lesion types. Modifications have been made to the original classification. Type II lesions are by far the most common and are also the source of the greatest diagnostic difficulty. To accurately classify superior labral (labrum) lesions, one must be aware of normal anatomy, including the many normal variants that are observed. The biceps tendon origin is divided roughly in half between the supraglenoid tubercle and the superior labrum. Vangsness et al demonstrated that the labral insertion is entirely or mostly into the posterior labrum about 55% of the time. Only a small percentage (~8%) have a predominant anterior insertion. The remainder have equal insertions to the anterior and the posterior labrum. In an anatomic study, Cooper et al noted that the superior portion of the labrum had a distinctly different morphology from the inferior labrum. The superior and anterosuperior portions were found to be loosely attached to the glenoid rim through thin connective tissue that easily stretched. This is similar to what is seen in the meniscus of the knee. In contrast, the inferior labrum had a firm attachment through thick inelastic fibers and appeared as a firm immobile extension of the glenoid articular cartilage. The 12-o'clock position was the only location on the glenoid rim where the hyaline articular cartilage extended over the rim of the glenoid. The biceps tendon inserts into the supraglenoid tubercle, which is 5 mm medial to the glenoid rim. This, along with the often meniscoid attachment of the superior labrum, results in a sublabral recess. This should not be mistaken for a type II SLAP lesion. As reported by DePalma, a sublabral recess may be present in as many as 50% of individuals older than 20 years. This incidence increases with patient age. In DePalma's study, more than 95% of the specimens obtained from patients in the seventh and eighth decades of life were found to have a sublabral recess. The middle glenohumeral ligament can sometimes insert directly into the superior labrum as a large thick cordlike structure (ie, the so-called Buford complex). In these cases, the anterosuperior labrum is absent. The Buford complex is not pathologic and should not be stabilized, because to do so would markedly restrict external rotation. A sublabral foramen can be observed where the anterosuperior labrum, from approximately the 1- to 3-o'clock position in a right shoulder, is loosely attached or not attached at all to the glenoid rim. Again, this is not pathologic and should not be stabilized; to do so would result in a significant loss of external rotation. Histologically, the superior labrum is composed of fibrocartilage, consisting of type II cartilage in a relatively acellular matrix with occasional interspersed elastin fibrils. This is in contrast to the hyaline cartilage of the glenoid and the dense fibrous glenohumeral capsule. Branches of the suprascapular, circumflex scapular, and posterior humeral circumflex supply the labrum. Periosteal and capsular vessels supply the labrum throughout its periphery. No vessels enter the labrum from the underlying bone. In general, the superior and anterosuperior labrum have less vascularity than other portions of the labrum. On a biomechanical level, incompetence of the superior labrum and biceps anchor has been shown to have a deleterious effect on anterior glenohumeral stability. In a cadaver study, Rodosky et al compared anterior glenohumeral stability in specimens with an intact superior labrum with those with a SLAP lesion. They demonstrated that the presence of a SLAP lesion decreased the torsional resistance by 11-19%, in comparison with the intact shoulder, as it was placed in the abducted and externally rotated position. The inferior glenohumeral ligament was subject to significantly increased (>100% greater) strain in the presence of a SLAP lesion. In another cadaver study, Pagnani et al demonstrated that a SLAP lesion resulted in significant increases in both anterior-posterior and superior-inferior translations. At 45° of elevation, a 6-mm increase was noted in anterior translation with the arm in neutral rotation, and a 6.3-mm increase in translation in internal rotation occurred. Several other studies have examined the strain changes in the superior labrum and biceps anchor with different positions of the throwing motion. Pradhan et al found that a significant increase in strain in the anterior and posterior portions of the superior labrum only occurs when the arm is in maximum external rotation, as is the case in the late cocking phase. Furthermore, the strain in the posterior portion of the superior labrum was significantly higher than that in the anterior portion. Kuhn et al supported these findings with their study of failure patterns of the superior labral–biceps complex. They found that failure was significantly more likely in the late cocking position than in the early acceleration position. In the late cocking position, nine of 10 specimens demonstrated failure of the superior labral–biceps complex. In contrast, of the 10 paired specimens that were tested in the early acceleration position, only two had failure of the this complex. The load to failure was significantly less in the late cocking position than in the early acceleration position. Of the five type II SLAP lesions that developed, four were in the late cocking positions. These studies emphasize the important role the superior labral–biceps complex likely plays in anterior shoulder stability. An unstable SLAP lesion found in the course of a Bankart repair should be stabilized. The important role of the posterior portion of the superior labrum likely reflects the fact that the biceps tendon attachment is usually posterior-dominant, as demonstrated in a study by Vangsness et al. In repairing SLAP lesions, particular attention should be given to ensuring that the posterior aspect is well stabilized. Clearly, engaging in throwing sports can predispose to the development of a SLAP lesion. The exact mechanism by which the lesion develops is somewhat controversial. In Andrews' original 1985 study, traction force placed on the superior labrum by the biceps tendon in the follow-through phase of the throwing motion was thought to be responsible for creating a SLAP lesion. The hypothesis was that the eccentric contraction of the biceps necessary to decelerate the elbow resulted in the biceps tendon detaching portions of the glenoid labrum. Subsequent studies, however, suggested that the forces generated during the late cocking phase are in fact the predominant factor. The peel-back mechanism described by Burkhart and Morgan  and the shear forces generated by a tight posteroinferior capsule are thought to be major contributing factors to developing type II SLAP lesions or variants thereof. The presence of a peel-back sign can be demonstrated arthroscopically. The arm is placed into 70-90° of abduction and then progressively rotated externally. In this position, the biceps vector is now more posteriorly and vertically oriented. To accommodate this, the base of the biceps twists. A torsional load is transmitted to the superior labrum, and if the posterosuperior labrum and biceps anchor are incompetent, medial displacement of the superior labral–biceps complex occurs. If more than 5 mm of the posterosuperior glenoid is uncovered or the biceps root at the level of the supraglenoid tubercle is uncovered, a posterior type II SLAP lesion is present. As already noted, posterior capsule tightness is thought to play an important role in the development of SLAP lesions. 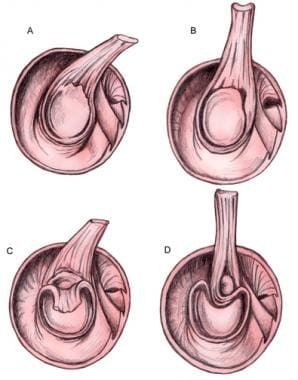 Almost all high-demand throwers develop a posterior capsular contracture with limitation of internal rotation. This tight posteroinferior capsule is thought to result in obligatory superior translation of the humeral head when the arm is in abduction and external rotation and, as a result, exposes the superior labrum to large shear forces. This increased shear force is most pronounced at the same time the peel-back forces are at their maximum, increasing the likelihood of a SLAP lesion developing. Superior labral (labrum) lesions are unusual. The reported prevalence in patients undergoing shoulder arthroscopy has ranged from 3.9% to 6%. In the largest series reported, SLAP lesions represented 6% of 2375 patients who underwent shoulder arthroscopy. The average age was noted to be 38 years, and 91% of the patients were male. The reported incidence of types I-IV is variable, with type II lesions being the most common. Type I lesions have been reported to account for 9.5-21% of all cases; type II, 41-55%; type III, 6-33%; and type IV, 3-15%. Initial reports suggested good results with arthroscopic superior labral repairs with a high success both in nonthrowing and throwing athletes, as well as a high rate of overhead athletes returning to their preinjury level of activity. [19, 20] Morgan et al reported on their results in 102 patients,  with 83% having excellent results and 14% having good results. All pitchers returned to pitching, 84% of them at preinjury levels. Pagnani et al reported that 12 of 13 overhead athletes were able to return to full preinjury level of activity after an arthroscopic superior labral tear. Field and Savoie,  as well as Burkhart et al,  reported similar findings. In Field and Savoie's study, all of the athletes were able to return to sports activities without limitation. Kim et al evaluated their results in 34 individuals who underwent arthroscopic suture anchor repair of an isolated SLAP lesion tear. Approximately 94% had a satisfactory result as determined by using the University of California Los Angeles (UCLA) shoulder score. Thirty-one (91%) of the patients regained their preinjury level of function. However, outcomes were poorer in overhead athletes than in those not participating in overhead athletic activities. In a prospective study, Brockmeier et al reviewed their outcomes after arthroscopic repair of a type II SLAP tear in 47 patients and reported that 87% had a good or excellent result. However, only 74% of the patients were able to resume their preinjury level of athletics. Patients with a discrete traumatic event had a greater likelihood of resuming preinjury level of activity. In a subgroup of 12 athletes who had discreet traumatic event, 11 (92%) were able to resume preinjury level of activity. Neuman et al retrospectively reviewed their results of type II superior labral repair in 30 overhead athletes. Overall, 93% had good-to-excellent results and 84% returned to preinjury level of play. However, with subgroup analysis, baseball players only had an 80% return to preinjury level of play compared with 94% for other overhead athletes. Popp D, Schöffl V. Superior labral anterior posterior lesions of the shoulder: Current diagnostic and therapeutic standards. World J Orthop. 2015 Oct 18. 6 (9):660-71. [Medline]. [Full Text]. Chang D, Mohana-Borges A, Borso M, Chung CB. SLAP lesions: anatomy, clinical presentation, MR imaging diagnosis and characterization. Eur J Radiol. 2008 Oct. 68(1):72-87. [Medline]. Cohen DB, Coleman S, Drakos MC, Allen AA, O'Brien SJ, Altchek DW. Outcomes of isolated type II SLAP lesions treated with arthroscopic fixation using a bioabsorbable tack. Arthroscopy. 2006 Feb. 22(2):136-42. [Medline]. Keener JD, Brophy RH. Superior labral tears of the shoulder: pathogenesis, evaluation, and treatment. J Am Acad Orthop Surg. 2009 Oct. 17(10):627-37. [Medline]. Morgan CD, Burkhart SS, Palmeri M, Gillespie M. Type II SLAP lesions: three subtypes and their relationships to superior instability and rotator cuff tears. Arthroscopy. 1998 Sep. 14(6):553-65. [Medline]. Vangsness CT Jr, Jorgenson SS, Watson T, Johnson DL. The origin of the long head of the biceps from the scapula and glenoid labrum. An anatomical study of 100 shoulders. J Bone Joint Surg Br. 1994 Nov. 76(6):951-4. [Medline]. Cooper DE, Arnoczky SP, O'Brien SJ, Warren RF, DiCarlo E, Allen AA. Anatomy, histology, and vascularity of the glenoid labrum. An anatomical study. J Bone Joint Surg Am. 1992 Jan. 74(1):46-52. [Medline]. DePalma AF, Callery G, Bennett GA. Variational anatomy and degenerative lesions of the shoulder joint. AAOS Instructional Course Lectures. 1949. 6:255-281. Pagnani MJ, Deng XH, Warren RF, Torzilli PA, Altchek DW. Effect of lesions of the superior portion of the glenoid labrum on glenohumeral translation. J Bone Joint Surg Am. 1995 Jul. 77(7):1003-10. [Medline]. Pradhan RL, Itoi E, Hatakeyama Y, Urayama M, Sato K. Superior labral strain during the throwing motion. A cadaveric study. Am J Sports Med. 2001 Jul-Aug. 29(4):488-92. [Medline]. Kuhn JE, Lindholm SR, Huston LJ, Soslowsky LJ, Blasier RB. Failure of the biceps superior labral complex: a cadaveric biomechanical investigation comparing the late cocking and early deceleration positions of throwing. Arthroscopy. 2003 Apr. 19(4):373-9. [Medline]. Burkhart SS, Morgan CD. The peel-back mechanism: its role in producing and extending posterior type II SLAP lesions and its effect on SLAP repair rehabilitation. Arthroscopy. 1998 Sep. 14(6):637-40. [Medline]. Neri BR, ElAttrache NS, Owsley KC, Mohr K, Yocum LA. Outcome of type II superior labral anterior posterior repairs in elite overhead athletes: Effect of concomitant partial-thickness rotator cuff tears. Am J Sports Med. 2011 Jan. 39(1):114-20. [Medline]. Van Kleunen JP, Tucker SA, Field LD, Savoie FH 3rd. Return to high-level throwing after combination infraspinatus repair, SLAP repair, and release of glenohumeral internal rotation deficit. Am J Sports Med. 2012 Nov. 40(11):2536-41. [Medline]. Pagnani MJ, Speer KP, Altchek DW, Warren RF, Dines DM. Arthroscopic fixation of superior labral lesions using a biodegradable implant: a preliminary report. Arthroscopy. 1995 Apr. 11(2):194-8. [Medline]. Burkhart SS, Morgan C. SLAP lesions in the overhead athlete. Orthop Clin North Am. 2001 Jul. 32(3):431-41, viii. [Medline]. Kim SH, Ha KI, Kim SH, Choi HJ. Results of arthroscopic treatment of superior labral lesions. J Bone Joint Surg Am. 2002 Jun. 84-A(6):981-5. [Medline]. Brockmeier SF, Voos JE, Williams RJ 3rd, Altchek DW, Cordasco FA, Allen AA. Outcomes after arthroscopic repair of type-II SLAP lesions. J Bone Joint Surg Am. 2009 Jul. 91(7):1595-603. [Medline]. [Full Text]. Neuman BJ, Boisvert CB, Reiter B, Lawson K, Ciccotti MG, Cohen SB. Results of arthroscopic repair of type II superior labral anterior posterior lesions in overhead athletes: assessment of return to preinjury playing level and satisfaction. Am J Sports Med. 2011 Sep. 39(9):1883-8. [Medline]. Mihata T, McGarry MH, Tibone JE, Fitzpatrick MJ, Kinoshita M, Lee TQ. Biomechanical assessment of Type II superior labral anterior-posterior (SLAP) lesions associated with anterior shoulder capsular laxity as seen in throwers: a cadaveric study. Am J Sports Med. 2008 Aug. 36(8):1604-10. [Medline]. Ben Kibler W, Sciascia AD, Hester P, Dome D, Jacobs C. Clinical utility of traditional and new tests in the diagnosis of biceps tendon injuries and superior labrum anterior and posterior lesions in the shoulder. Am J Sports Med. 2009 Sep. 37(9):1840-7. [Medline]. Gobezie R, Zurakowski D, Lavery K, Millett PJ, Cole BJ, Warner JJ. Analysis of interobserver and intraobserver variability in the diagnosis and treatment of SLAP tears using the Snyder classification. Am J Sports Med. 2008 Jul. 36(7):1373-9. [Medline]. Stetson WB, Templin K. The crank test, the O'Brien test, and routine magnetic resonance imaging scans in the diagnosis of labral tears. Am J Sports Med. 2002 Nov-Dec. 30(6):806-9. [Medline]. Green RA, Taylor NF, Mirkovic M, Perrott M. An evaluation of the anatomic basis of the O'Brien active compression test for superior labral anterior and posterior (SLAP) lesions. J Shoulder Elbow Surg. 2008 Jan-Feb. 17(1):165-71. [Medline]. Kim SH, Ha KI, Han KY. Biceps load test: a clinical test for superior labrum anterior and posterior lesions in shoulders with recurrent anterior dislocations. Am J Sports Med. 1999 May-Jun. 27(3):300-3. [Medline]. Jobe CM. Posterior superior glenoid impingement: expanded spectrum. Arthroscopy. 1995 Oct. 11(5):530-6. [Medline]. McCaughey R, Green RA, Taylor NF. The anatomical basis of the resisted supination external rotation test for superior labral anterior to posterior lesions. Clin Anat. 2009 Sep. 22(6):665-70. [Medline]. Dessaur WA, Magarey ME. Diagnostic accuracy of clinical tests for superior labral anterior posterior lesions: a systematic review. J Orthop Sports Phys Ther. 2008 Jun. 38(6):341-52. [Medline]. Somerville LE, Willits K, Johnson AM, Litchfield R, LeBel ME, Moro J, et al. Clinical Assessment of Physical Examination Maneuvers for Superior Labral Anterior to Posterior Lesions. Surg J (N Y). 2017 Oct. 3 (4):e154-e162. [Medline]. [Full Text]. Tibone JE, Jobe FW, Kerlan RK, et al. Shoulder impingement syndrome in athletes treated by an anterior acromioplasty. Clin Orthop Relat Res. 1985 Sep. 134-40. [Medline]. Beltran J, Bencardino J, Mellado J, Rosenberg ZS, Irish RD. MR arthrography of the shoulder: variants and pitfalls. Radiographics. 1997 Nov-Dec. 17(6):1403-12; discussion 1412-5. [Medline]. Dinauer PA, Flemming DJ, Murphy KP, Doukas WC. Diagnosis of superior labral lesions: comparison of noncontrast MRI with indirect MR arthrography in unexercised shoulders. Skeletal Radiol. 2007 Mar. 36(3):195-202. [Medline]. Connell DA, Potter HG, Wickiewicz TL, Altchek DW, Warren RF. Noncontrast magnetic resonance imaging of superior labral lesions. 102 cases confirmed at arthroscopic surgery. Am J Sports Med. 1999 Mar-Apr. 27(2):208-13. [Medline]. Jee WH, McCauley TR, Katz LD, Matheny JM, Ruwe PA, Daigneault JP. Superior labral anterior posterior (SLAP) lesions of the glenoid labrum: reliability and accuracy of MR arthrography for diagnosis. Radiology. 2001 Jan. 218(1):127-32. [Medline]. Holzapfel K, Waldt S, Bruegel M, et al. Inter- and intraobserver variability of MR arthrography in the detection and classification of superior labral anterior posterior (SLAP) lesions: evaluation in 78 cases with arthroscopic correlation. Eur Radiol. 2010 Mar. 20(3):666-73. [Medline]. Oh DK, Yoon YC, Kwon JW, et al. Comparison of indirect isotropic MR arthrography and conventional MR arthrography of labral lesions and rotator cuff tears: a prospective study. AJR Am J Roentgenol. 2009 Feb. 192(2):473-9. [Medline]. Lee SH, Yun SJ, Yoon Y. Diagnostic performance of shoulder magnetic resonance arthrography for labral tears having surgery as reference: comparison of high-resolution isotropic 3D sequence (THRIVE) with standard protocol. Radiol Med. 2018 Mar 26. [Medline]. Kim YJ, Choi JA, Oh JH, Hwang SI, Hong SH, Kang HS. Superior labral anteroposterior tears: accuracy and interobserver reliability of multidetector CT arthrography for diagnosis. Radiology. 2011 Jul. 260(1):207-15. [Medline]. [Guideline] Michener LA, Abrams JS, Bliven KCH, Falsone S, Laudner KG, McFarland EG, et al. National Athletic Trainers' Association Position Statement: Evaluation, Management, and Outcomes of and Return-to- Play Criteria for Overhead Athletes With Superior Labral Anterior-Posterior Injuries. J Athl Train. 2018 Mar. 53 (3):209-229. [Medline]. [Full Text]. Gottschalk MB, Karas SG, Ghattas TN, Burdette R. Subpectoral biceps tenodesis for the treatment of type II and IV superior labral anterior and posterior lesions. Am J Sports Med. 2014 Sep. 42 (9):2128-35. [Medline]. Erickson J, Lavery K, Monica J, Gatt C, Dhawan A. Surgical treatment of symptomatic superior labrum anterior-posterior tears in patients older than 40 years: a systematic review. Am J Sports Med. 2015 May. 43 (5):1274-82. [Medline]. Boileau P, Parratte S, Chuinard C, Roussanne Y, Shia D, Bicknell R. Arthroscopic treatment of isolated type II SLAP lesions: biceps tenodesis as an alternative to reinsertion. Am J Sports Med. 2009 May. 37(5):929-36. [Medline]. Hurley ET, Fat DL, Duigenan CM, Miller JC, Mullett H, Moran CJ. Biceps tenodesis versus labral repair for superior labrum anterior-to-posterior tears: a systematic review and meta-analysis. J Shoulder Elbow Surg. 2018 May 23. [Medline]. Chalmers PN, Trombley R, Cip J, Monson B, Forsythe B, Nicholson GP, et al. Postoperative restoration of upper extremity motion and neuromuscular control during the overhand pitch: evaluation of tenodesis and repair for superior labral anterior-posterior tears. Am J Sports Med. 2014 Dec. 42 (12):2825-36. [Medline]. Chalmers PN, Erickson BJ, Verma NN, D'Angelo J, Romeo AA. Incidence and Return to Play After Biceps Tenodesis in Professional Baseball Players. Arthroscopy. 2018 Mar. 34 (3):747-751. [Medline]. Edwards SL, Lee JA, Bell JE, Packer JD, Ahmad CS, Levine WN. Nonoperative treatment of superior labrum anterior posterior tears: improvements in pain, function, and quality of life. Am J Sports Med. 2010 Jul. 38(7):1456-61. [Medline]. Lim MH, Chan BK, Low CO. Arthroscopic management of superior labral anterior and posterior (SLAP) and associated lesions: clinical features and functional outcome. Ann Acad Med Singapore. 2008 Jan. 37(1):44-8. [Medline]. Neri BR, Vollmer EA, Kvitne RS. Isolated type II superior labral anterior posterior lesions: age-related outcome of arthroscopic fixation. Am J Sports Med. 2009 May. 37(5):937-42. [Medline]. Yoneda M, Hirooka A, Saito S, Yamamoto T, Ochi T, Shino K. Arthroscopic stapling for detached superior glenoid labrum. J Bone Joint Surg Br. 1991 Sep. 73(5):746-50. [Medline]. Yoo JC, Lee YS, Ahn JH, Park JH, Kang HJ, Koh KH. Isolated suprascapular nerve injury below the spinoglenoid notch after SLAP repair. J Shoulder Elbow Surg. 2009 Jul-Aug. 18(4):e27-9. [Medline]. Koh KH, Park WH, Lim TK, Yoo JC. Medial perforation of the glenoid neck following SLAP repair places the suprascapular nerve at risk: a cadaveric study. J Shoulder Elbow Surg. 2011 Mar. 20(2):245-50. [Medline]. Chan H, Beaupre LA, Bouliane MJ. Injury of the suprascapular nerve during arthroscopic repair of superior labral tears: an anatomic study. J Shoulder Elbow Surg. 2010 Jul. 19(5):709-15. [Medline]. Area of labral detachment is debrided to expose a bony bed. The awl for the anchor is introduced either through the anterosuperior portal or can be introduced percutaneously from a posterolateral portal. The suture limbs are passed through the labrum. Either a simple or mattress stitch can be utilized. Various suture passing techniques can be used to accomplish this. In a 1-anchor repair, 1 suture can passed through the labrum posterior to the biceps and the other anterior to the biceps and tied down. Multiple anchors should be used if necessary.